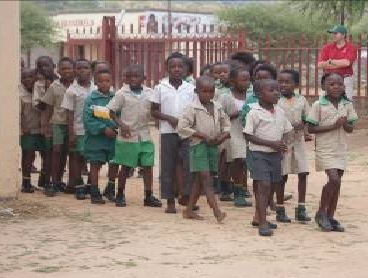 Kwa Maritane sponsors a local primary school that educates 410 scholars from families with little to no income. During 2013 many of these children were left orphaned. While hosting an annual Christmas party for the children, we observed that many of our students either had no shoes, or the toes of the shoe had been cut out to allow there growing feet to extend over the soles. We found it heartbreaking to say the least that we were unable to do more for these children. Through the Pack for a Purpose project over the Festive season, we received many amazing donations from generous guests. Of these guests, 3 sets of kind people stay in my heart. These guests donated in total 24 pairs of school shoes. A monetary donation we received also allowed us to buy school socks for the children. This is the start to our prayers being answered. 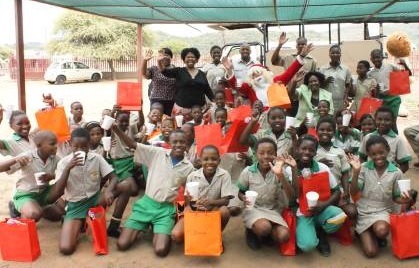 When schools reopened this year, we were able to go along to the school and assist some of the children with shoes. Nothing hits home more than the smile of a child that can now walk with pride. I have always believed if you feel good about yourself great things are possible. Through these kind donations, hopefully, these shoes will inspire our students to study hard and become future doctors, lawyers or even presidents. Thank you never seems to be enough. Without the kind travelers that support Pack for a Purpose, our dream of supplying a uniform and stationary pack per child no longer seems unrealistic. Thank you, thank you thank you.